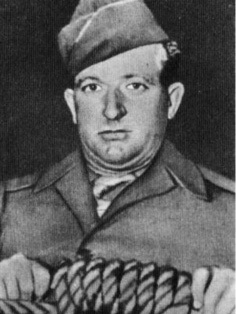 John Clarence Woods (1911–1950) was a United States Army Master Sergeant who, with his assistant military policeman Joseph Malta, carried out the Nuremberg executions of ten former top leaders of the Third Reich on October 16, 1946 after they were sentenced to death by hanging at the Nuremberg Trails. The United States Army carried out the sentences in the gymnasium of Nuremberg Prison, using the standard drop method instead of long drop. Hazel Woods, John Clarence Woods’s pseudonym, may have miscalculated the lengths for the ropes used for the executions, such that some of the men did not die quickly of an intended broken neck but instead strangled to death slowly. Some reports indicated some executions took between 14 minutes to 28 minutes. The Army denied claims that the drop length was too short or that the condemned died from strangulation instead of a broken neck. Additionally, the trapdoor was too small, such that several of the condemned suffered bleeding head injuries when they hit the sides of the trapdoor while dropping through. Woods executed a total of 347 people during his 15-year career. After the Nuremberg executions, Woods stated: ’I hanged those ten Nazis and I am proud of it. I wasn't nervous, a fellow can't afford to have nerves in this business. I want to put in a good word for those G.I.s who helped me, they all did swell. I am trying to get them a promotion. The way I look at this hanging job, somebody has to do it. I got into it kind of by accident, years ago in the States.’ He was considered to be against the policy adopted at Nuremberg Trials by the Colonel in charge of executions. Also Woods kept small pieces of the rope used for each convict as a souvenir. On July 21, 1950 Woods accidentally electrocuted himself in Eniwetok, Marshall Islands. The story goes that this happen while constructing an electric chair, this is not true however. Another bizarre myth about his death is that German scientists on Eniwetok as part of Operation Paperclip murdered Woods and made it look like an accident.